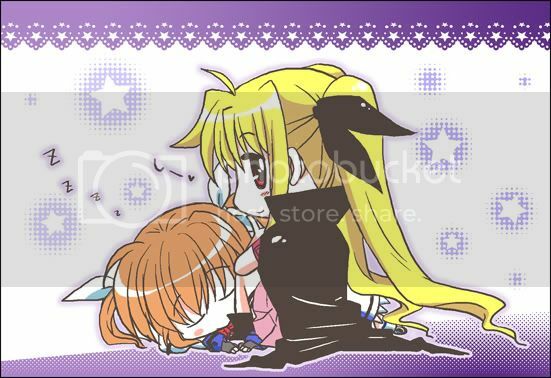 For some reason, I didn't like Nanoha clinging to Yuuno and even calling him onii-chan. Updated chap 6! And you've just read chap1 ==". Read all the chapters have been released recently. I... generally don't like to be the one to rain on a parade here. Especially for a non-english native speaker. But I found something that rather disturbs me. I assume it's an innocent mistake, but; Your story, lyrical lovers is almost a word for word copy of a Satashi story from a few years ago, especially for the first few chapters. I assume that its just a coincidence, or that you really liked how that story started and wished to take it in another direction, borrowing the characters and ideas. But i would think it would be nice in this instance to reference where you got the idea from. And/or contact the author and let them know you'd like to use their ideas. That's all. I know the first chapters is terrible similar to Satashi's and i'm deeply sorry Satashi cuz i wrote this fic after read hers. But i've tried my best to not copy her story and the rest of story is completely different. Once again. I'm sorry, Satashi.